Platinum Anchor chain. 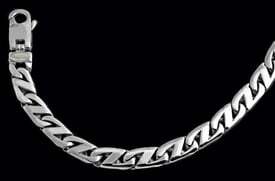 Beautiful Platinum chain available in a large variety of widths and ANY custom length. Price shown is for the 8 inch bracelet 6mm wide, gram weight 23.98grams. Some standard lengths are listed, add to cart to view pricing. Email sales@platinumonly.com for additional pricing on this great Platinum chain.